What is the best gaming phone in 2019? While pretty much everyone has a mobile phone nowadays, a relatively small number actually choose a handset based on its gaming capabilities. That's actually a real shame because, as phone cameras and batteries tend to equalise at a certain point, the gaming capabilities of phones vary wildly. Some of the most expensive phones on the market, for example, are pretty poor for gaming because they're just not configured for it. Certain phones can't even run Fortnite mobile, for example, and only a select few can play it at 60fps to make it smoother than a buttered loot llama. The best gaming phones have powerful internal processors, sure, but they also have screens that suit gaming, they have more storage to let you download more apps, and they have software boosts to help optimize your handset for play. And for maintaining battery life if you're going into a heavy gaming session. On GamesRadar we test phones with gaming in mind, and play all kinds of the best Android games / iPhone games on each handset before delivering a verdict and - maybe - adding a phone to this guide. We also test all the other features, and take that into account, but we want to make sure each one is actually good for games. 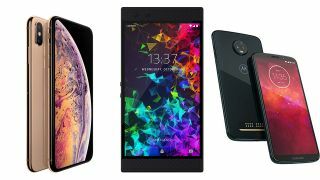 Here are the best gaming phones in 2019. Shockingly, the best phone for gaming isn't an iPhone, or a specialist like the Razer Phone. It's actually the Honor View 20, which is an Android device with a relatively low-key reputation. However, the View 20 ticks all the boxes for gamers: there's a large, 6.4" screen that handles 1080p+ content, a powerful processor and internal spec that means it's one of a handful of phones that can run Fortnite at 60fps, there's plenty of internal storage as standard, and it's actually cheaper than most rivals. The drawbacks are few and far between. The screen is slightly lower resolution than some competitors, only offering FHD+ instead of QHD, but the difference is barely noticeable. And there's no SD card slot, so once the 128GB/256GB memory is full, you can't expand it. Really, though, that's it. There are a bunch of features designed to enhance gaming specifically, like Wifi signal boosters and a forthcoming Gaming+ mode that will not only enhance the visual prowess of games, but will reduce their strain on the enormous battery. The 48MP rear camera is stunning, the 25MP front-facing selfie camera comes with some great features, and the whole thing runs incredibly efficiently, far surpassing the battery life on equivalent models like the Razer Phone 2 and Galaxy S9. It's a fantastic phone for gaming. The Razer Phone 2 really is a marvel when it comes to gaming. That 5.7-inch screen, which does both HDR and 120Hz refresh rate is a thing of beauty, and it enhances pretty much any game you stick on there. No, it isn't edgeless, and it still sticks to the 16:9 aspect ratio, but the quality of the picture more than compensates for this. Add in the Dolby Atmos sound, and the terrifyingly fast Snapdragon 845 processor, and this will run anything you throw at it with panache. The overall build and feel of the phone is large, chunky and well made, so you know it won't break if you get a bit excited on the train, playing PUBG. It runs Android, so you're getting a phone with a neat, customizable OS, and there are loads of settings within the system to allow you to prioritize gaming and movie watching. The battery is commendable too, offering both rapid charging (which means you're fully charged from 0% in under two hours) and a whopping usage time of 10+ hours. That's not just messaging and occasional use either; that's playing games, using the camera, and accessing the media player. The battery especially stacks up very well against this phone's competition. The Razer Phone 2 is only let down by everyday use features. Yes, it's large, and no it doesn't have a headphone socket, but it's a powerful phone specifically designed for gaming. If that's your primary concern, this is way ahead of the competition. Best for... Anyone who primarily uses their phone for gaming. The Apple iPhone XS Max is the biggest iPhone yet, both in physical size and in price. This is the big boy of Apple's latest lineup, and its 6.5-inch screen just skirts the divide between tablet and phone. There's not much bezel here, fortunately, but the screen alone is enough to make the iPhone XS Max unmanageable in one hand for any but the largest palmed. Gaming on the iPhone XS Max is a dream, though the $1,099 price tag for the 64 GB model might make it seem like an unattainable one. These phones are expensive, though holding one in your hand(s) you see where the money goes. The XS Max has the traditional Apple polish and lacks the rough edges that many Android devices have. LG, Samsung, Google, and some other major Android device manufacturers have caught up considerably, but Apple is still the one to beat when it comes to fit and finish. Gaming on iOS brings you face to face with one of iOS's most significant strengths for some and greatest weakness for others. Your selection of titles has only one source: the Apple App Store. While there are thousands of great titles to choose from, and you have very little to worry about when it comes to malware or incompatibility, the iPhone XS Max, like its brothers, just can't match the flexibility of Android. The iPhone XS Max is a premium device with a price to match, and it's not worth the money for some. However, if you're locked into the iOS ecosystem and you love gaming, there's no better phone available right now. Best for... People who want to game on iOS on a large screen but don't want to be bothered to carry around an iPad. For those who opted out of an iPhone X or even the larger-than-life iPhone 8 Plus, the Galaxy S9 Plus is a fantastic alternative. Its capable Snapdragon 845 processor packs this smartphone full of power that's noticeable in just about every single aspect of the phone. Whether you're looking to run a few rousing games of The Elder Scrolls Legends or put the phone through its paces with a resource-heavy game like Fortnite, this pocket powerhouse can handle anything that throws at it, even if you're looking to multitask. You can also utilize the special proprietary Game Tools app if you want to capture gameplay footage or screenshots, which works quite well. Colorful casual games offer eye-popping color with the AMOLED display, and you get vibrant visuals and the blackest of blacks when tackling realistic titles as well. The phones' extensive storage and stereo speakers round things out for an incredible package that could only be improved by extending its battery life. Unfortunately, you'll be forced to charge it after only few hours' use if preoccupied with heavy gaming sessions. Despite that, it's by far one of the best Android-centric options for gaming currently on the market. When you want a quality smartphone experience for gaming, look no further than the manufacturer of the PlayStation 4 itself: Sony. The Sony Xperia XZ2 is an exercise in decadence that may not measure up to the rest of the never-ending cavalcade of smartphone releases over the rest of the year, but it still sports several features that push it quite far ahead of the rest of the pack. Its top-of-the-line Snapdragon 845 chipset powers a stunning 1080 x 2160 HDR display with 5.7 inches of screen real estate that's perfect for any game, bolstering performance in a big way. But other phones offer largely the same setup – it's the Xperia XZ2's stereo speakers that end up setting it apart. Its dual front-facing speakers are something to marvel over, especially when playing games where sound matters and earbuds just won't do. Coupled with its haptic feedback, dubbed the "Dynamic Vibration System," it offers one of the closest things to a true console experience any other smartphone has yet to deliver. With decent battery life thanks to its 3,180 man battery and microSD support for an abundance of storage, Sony's excellent smartphone is a viable contender for on-the-go gaming, no matter what your preferences lean toward. If you want Android the way it was meant to be, look no further than the Google Pixel 3 XL. This phone, straight from the creators of Android themselves, offers a stock Android experience on an absolute beast of a device. It's not a massive improvement over the Google Pixel 2 XL, but if you're looking to upgrade from a phone that's a couple of years old, you'll be hard-pressed to find a model that can top the Pixel 3 XL. The Pixel series is the spiritual successor to Google's Nexus line, but where the Nexus cut corners to offer a premium product at a low price, the Pixel goes for broke. It touts a camera that surpasses the iPhone in many tests, and the new mode of OLED screen fixes any of the problems the Pixel 2XL had with washed out colors. However, all that comes at a cost. Though gaming on the Pixel 3 XL is a pleasure, the $900 price tag is getting into iPhone territory. Given that it shares the same CPU with many current flagships, and even has less RAM than some, you may do better to shop around for a similar phone. If money is no object, though, the Google Pixel 3 XL is one of the best ways to experience Android. It receives updates straight from Google, so you're not stuck waiting months for the latest version of Android, and it has a lively development community, so if the stock feel isn't your thing you can tinker until you find something that is. Best for... Those who are hellbent on running stock Android on a powerful device and have money to burn. The iPhone XR has all of the meat of the iPhone X and none of the gristle. While some might miss the dual cameras or OLED screen, when it comes to gaming the iPhone XR matches and perhaps even exceeds its predecessor. The new A12 Bionic processor that the iPhone XR shares with its bigger brothers, the XS and XS Max adds a little more oomph over the A11 found in the iPhone X, and as mobile games continue to grow more sophisticated you'll be glad for the extra horsepower. The biggest appeal of the XR over other current iPhone models is the price. At $799 unlocked, the iPhone XR gives you performance matching that of the XS for $200 less. Despite some Android phones having more impressive stats on paper, you'll find that games tend to be better optimized on iOS, an advantage of only having to support a small number of devices. However, the XR also comes with the iPhone's biggest weakness. If you're someone who likes to tinker with new phone ROMs or wacky stuff like streaming your PC games to your phone, the iPhone XR just doesn't have that flexibility. When it comes to gaming it's the Apple App Store or bust, and that might be a dealbreaker depending on what you desire out of your phone. If the best and the brightest mobile tech doesn't concern you and you just need a formidable piece of hardware suitable for gaming, the Nokia 6.1 is a viable option. It's perfect for mobile gamers who want a more cost-effective option than the latest and greatest selections out there, and while it sacrifices newer tech for a lower price, it's still capable of reliable performance. The stylish Nokia phone comes standard with the Snapdragon 630, which obviously isn't the top of the line when it comes to processing power, but the phone's decent amount of RAM ensures there are few issues when playing labor-intensive games. Still, it’s a bit less than what you may be used to. You won't be able to crank up your graphics settings to Ultra or anything like that, but it's perfectly fine if all you care about is having an available mobile device to jump into the most popular titles out on the App Store or Google Play Store with friends. You get a decent suite of additional specs as well for the price, but the spotlight here is the price, since it's the most affordable out of the current crop of phones out there appropriate for regular gaming. It's nowhere near top-tier with its list of specs, but the price is certainly right, and that lets it hang with the best of them. The Motorola Z3 is another midrange phone in Motorola's confusingly-named lineup. Not to be confused with the Motorola Z3 Play, the Z3 is a Verizon-exclusive phone that offers excellent performance in an affordable package. Of course, this device will have limited appeal, being sold exclusively through Verizon Wireless. However, if that happens to be your carrier and you're looking to get a (close to) top-of-the-line Android phone for a little more than half of what Samsung, LG, and Apple's offerings retail for, the Z3 is worth checking out. Besides the more than adequate device specs, the Moto Z3 will appeal to gamers because of Moto Mods. The Z3 is one of the only phones to allow you to expand its capabilities with add-ons. You can get a gamepad that fits the phone perfectly and adds two joysticks, a D-pad, four face buttons, and two shoulder buttons on each side. The Moto Gamepad also adds another 1035 mAh battery to augment the Z3's internal power so you can game longer. The Moto Mods can be a bit expensive, but they're custom made to fit the platform and add extendability to the Z3 that other phones just don't have. If you're looking at mid-range Android phones and happen to use Verizon as your carrier, consider the Z3 if you plan on using your device for a lot of gaming. Best for... Those who use Verizon as their carrier and want a cheaper phone with great specs and amazing modability.